Product prices and availability are accurate as of 2019-04-18 13:56:01 EDT and are subject to change. Any price and availability information displayed on http://www.amazon.com/ at the time of purchase will apply to the purchase of this product. 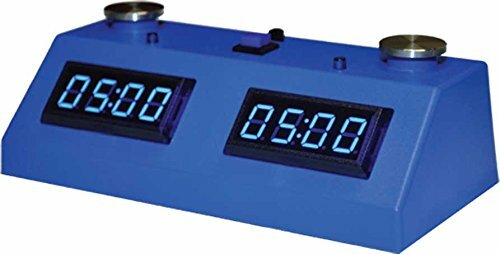 ZMF-II Digital Chess Clock - Blue LED Display / Blue Case ZMF-II Chess Clocks - Easy to program / easy to use. Modern LED technology w/ eye-catching colors. 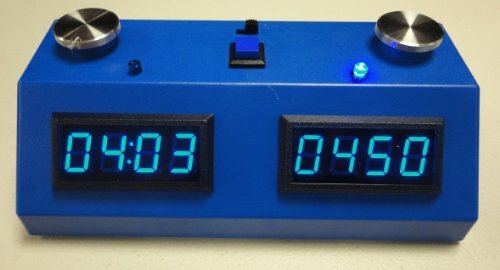 Clocks designed and engineered by avid chess players, used for zmartfun nearly every competitive two-player board game. Uses 4 C Batteries, not included - available in drop down. MADE IN THE USA! Stainless steel touch sensing buttons. Very easy to program menus. Delay, Increment, Hour-glass, and Byo-yomi timing modes. Programmable tournament modes with moves counter. Three time controls available. Dual timer mode (both timers can go up or down simultaneously or one at a time). 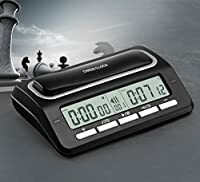 Score keeper mode (clock can be used to keep the score in a match) Three different preset settings/modes can be kept in memory at all times. Highly accurate clock. Sound and LED indicators can be turned off. 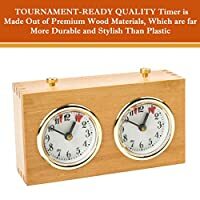 Clock can be used for nearly every competitive two-player board game like Scrabble, Shogi, and Go. Low power consumption. Batteries should provide power for more than 1600 hours of use under normal conditions (compare to 600 hours of use that other clocks offer). Very strong plastic enclosure to protect your clock. Transparent windows for the displays are made of high impact-resistance polycarbonate (this is the same material used in the thick barriers of transparent plastic used in teller's windows in banks). Affordable price. 4 C batteries not included. Patent pending.